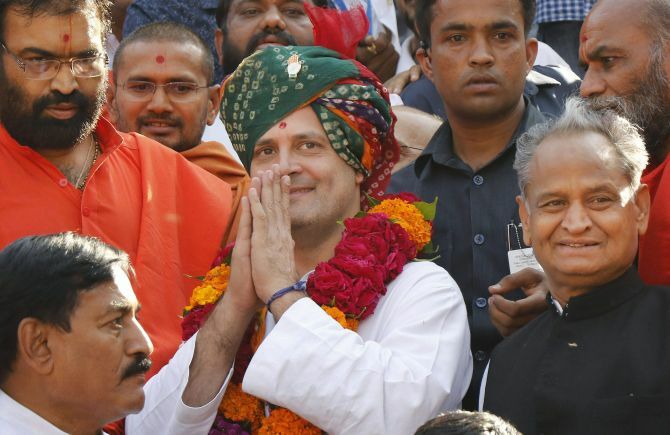 Congress vice president Rahul Gandhi on Thursday signed off his two-day tour of poll-bound Gujarat with a promise to waive loans of farmers and provide free education in government-aided colleges if the Congress party comes to power in the state. Unfazed by the Somnath temple controversy, he visited Gadhdha Swaminarayan temple where he offered prayers. Attacking Prime Minister Narendra Modi, the Congress leader claimed, "Modiji waived loans worth Rs 1.25 lakh crore of his five-ten industrialists friends, but Modiji and (Finance Minister Arun) Jaitleyji say that it is not their policy to waive loans of farmers when they ask for it." He was campaigning in Lathi in the Patidar-dominated Amreli district on the last day of his two-day tour. "Modiji talked for 22 years about farmers, but you have not got anything, your land has been taken away, your water is diverted to industrialists, and you do not get crop insurance," he told a poll meeting. "We make this promise to you that we will frame a policy within 10 days of forming government in Gujarat to waive your loans," he said. Gandhi promised free college education in government-aided colleges and said that fees in other colleges will be reduced by 80 per cent if the Congress is voted to power in Gujarat. He said the middle class and poor people have to pay Rs 10-15 lakh to realise their dream of making their children engineers or doctors. "We will offer free education in government-aided collages which are given money and aid by the government. (We will) reduce by 80 per cent fees (in other colleges)," he said. Accusing Modi of proximity with select corporates, Gandhi said for the first time he has seen that all sections of the society in the state were 'protesting', whether it was the Patidars, Dalits, anganwadi workers or farmers. "Only five-ten persons are not protesting. They fly in chartered planes and are Modiji's friends," he said, alleging that 'some of them get Rs 33,000 crore (loan) to make Nano car'. "If you ask questions, whether you are a Patidar, farmer, Dalit, they will fire at you, beat you up, and will beat up women. But if five-ten people will ask for your land, electricity, water, Modiji will immediately sign for them," he said, alluding to the 2015 quota stir in which 14 Patidars were killed in police firing. Describing Gujarat Chief Minister Vijay Rupani a 'rubber stamp', he alleged that Bharatiya Janata Party president Amit Shah was remote-controlling the government in the western state. "Earlier Modiji used to do so. Now Amit Shah does the same. I have not taken the name of Rupaniji because he runs on remote control. Shahji can change the channel whenever he likes," Gandhi said attacking the BJP leadership. He said the previous United Progressive Alliance government allocated Rs 35,000 crore in Mahatma Gandhi National Rural Employment Guarantee Act and waived loans worth Rs 70,000 crore of farmers of the entire country. "The amount of money that I put in MNREGA was given by Narendra Modiji to Tata Nano car factory. You lost your land, it was snatched from you, and given to Nano factory," he said. Breaking its silence over Gandhi's charge that the BJP-led Gujarat government extended undue favours of Rs 33,000 crore to it for its car manufacturing facility at Sanand, Tata Motors said it got Rs 584.8 crore as loan, and not grant. The investor-friendly environment created by the Gujarat government encouraged Tata Motors to set up its manufacturing plant in Sanand, with a long-term vision to make it one of the leading automotive hubs, further enabling the state to contribute to the prosperity and growth of India, the company said in a statement. At the election rally, Gandhi said, "You will not get Narmada water when you ask for it, but Modiji's friends will get it immediately. They get 14 hours power supply, while you get it for a few hours." He also said that the farmers were not getting the minimum support price for their produce in spite of the 'promise' by Modi to provide them a high MSP. "You gave Rs 20,740 crore to insurance companies in Gujarat (for crop insurance), and they gave back Rs 4,700 crore and made profit of Rs 15,000 from your pocket," Gandhi said. "Modiji will not tell you this in his speech. Modiji is behind the death of farmers who kill themselves after not receiving insurance money," Gandhi said. "One of Modiji's industrialist friends got 45,000-acre land in Mundra port at Re 1 per square metre as a gift. In months, this man sold the same land at a rate of Rs 35,000 (per square metre)," Gandhi alleged without taking any name.